Alanis is both cynically funny and emotionally deep, giving this entertaining mystery a protagonist to root for. Alanis McLachlan believed that she left her past far behind. When she learns of her mother’s sudden death, she finds herself once again drawn into a world she went to great lengths to escape. The White Magic Five and Dime, by Steve Hockensmith and Lisa Falco, is fast paced and engrossing, following Alanis’s somewhat reluctant journey of the soul as she uncovers details about her mother’s death and comes to terms with her past. Estranged for decades, Alanis never expected anything from her mother. 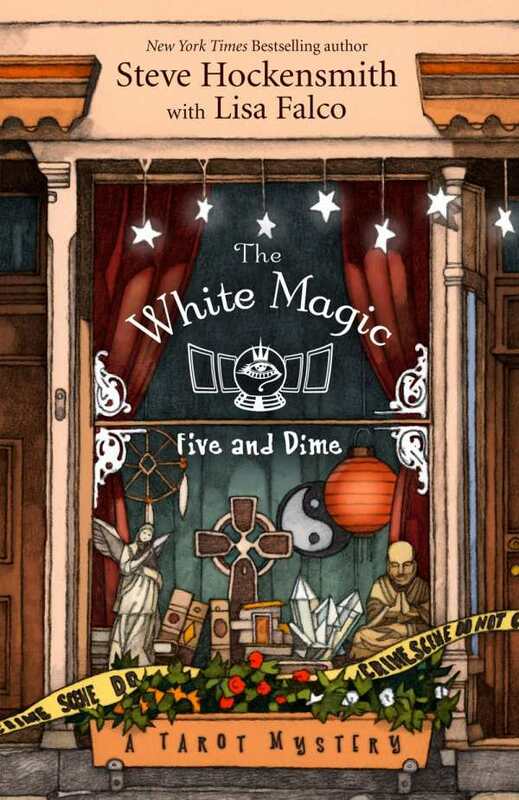 She is surprised, however, to learn that her mother willed her an inheritance, including a new-age store called the White Magic Five and Dime. When she arrives in Berdache, Arizona, to claim her unexpected property, she decides to stick around and find out who hated her mother enough to murder her. With the reluctant help of a handsome cop and her mother’s teenage boarder, Alanis discovers the victims of her mother’s most recent cons and sets out to right a few wrongs. Hockensmith and Falco craft a clever and compelling tale filled with colorful and engaging characters and a whodunit plot that some may find a bit predictable but that is never less than entertaining. In keeping with the titular setting, the beginning of each chapter is accompanied by a drawing of a tarot card, along with the explanation of the card’s meaning, as found in the book Alanis reads throughout. It’s a device that works well, offering hints to chapter content as well as glimpses of Alanis’s unique sense of humor. Hockensmith and Falco shine brightest in their characterizations, which are solid and effective; this is particularly evident in the depth to which Alanis’s character is developed. Cynical, witty, a bit hardened, but with a distinct soft side, Alanis is a master of protecting herself. Her childhood with a con-artist mother, who never seemed to value her daughter beyond her use as a pawn in one of her schemes, ultimately led Alanis to leave her mother behind. Even so, though she first protests caring about her mother, she is finally compelled to find out who killed her. As she learns more about the most recent part of her mother’s life, Alanis begins to discover a way to reconcile with both her past and her possible future. Steve Hockensmith is the author of Pride and Prejudice and Zombies: Dawn of the Dreadfuls, among other works, and Lisa Falco is the author of A Mother’s Promise.